Now we’re talking! 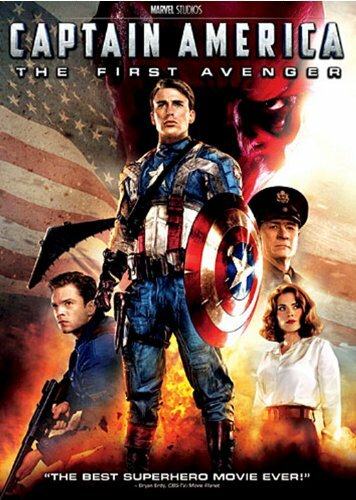 Here’s a real superhero movie, Captain freaking America. I’ve seen this movie before, but I am proud to have it be my duplicate movie in this challenge. I watched it with my uninitiated boyfriend, who was under the impression that Thor was the best pre-Avengers superhero flick. As if. The gist: Chris Evans plays a 98-pound weakling who’s so desperate to become a soldier in World War II that he enlists five times in five different areas. This draws the attention of Dr. Strange Accent, payed by Stanley Tucci. He created a super-soldier serum that eventually led to the psychopath Red Skull, and now he’s interested in making an American equivalent so everyone can forget he effed up. This is never mentioned again, but oh well. What matters is that Future Captain America gets into the Army on the recommendation of Dr. Strange Accent, where he meets PEGGY CARTER. The GODDESS. Seriously, this lady kicks tail and is an amazing shot. Nerd girls worship her, and there are a million reasons why. But she escorts Future Captain America to his destiny: Getting the Red Skull shot. Chris Evans hulks out over the shot and transforms into the guy you see on the poster. At first he’s just a propaganda figure, much like the actual character of Captain America in the 1940s. This is where the movie proves most charming to me. There are lots of nods to the actual role of the original comic book character, and the entire first half of the movie is all about placing Captain America within his world. I never expected Chris Evans to be the type of actor who’d play a good superhero. But it’s Captain America’s humanity that makes the role. It’s the vulnerable little smiles he makes when watching himself in an anti-Nazi short film, or the striving frustration in basic training. You’re almost sad to see the more realistic elements of Captain America fade away into a more generic superhero plot. Red Skull’s split off from the Third Reich to form a science-fueled group of super-Nazis, and has managed to secure one of the greatest treasure of Thor’s universe. He’s planning on using it to pretty much nuke the world and start over. There’s also some pathos about Red Skull and Captain America being the same type of Übermensch and yet Captain America fights on the side of a country. What I “learned”: The best myths are the ones grounded in reality. Chris Evans works as Captain America because he brings humanity to an otherwise ridiculous role. He feels familiar, not a caricature. See this movie if you like: PEGGY “NAZI-SHOOTER” CARTER. And Chris Evans doing his thing as a superhero who just wanted to be a soldier. And Tony Stark’s ancestor who looks a lot like Andrew Ryan from Bioshock. Also, Tommy Lee Jones signed on for this thing. Beautiful stuff.